Fullback Hugo Southwell made his Scotland debut against Samoa in 2004 and subsequently played every international until he sustained an injury during a Six Nations match against Ireland in 2007, a remarkable 30 Tests. Southwell recovered from injury in time to make his World Cup debut against Portugal in St Etienne in 2007 and was back in action as Scotland' first-choice fullback for the 2008 Six Nations, including their Calcutta Cup victory over England at Murrayfield. 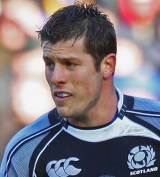 He toured Argentina with Scotland in the summer of 2008, playing in the second Test win in Buenos Aires. He made two replacement appearances against South Africa and New Zealand during the 2008 autumn internationals before some superb club form for Edinburgh in the Heineken Cup and Magners League led to a call-up into the Scotland squad for the 2009 Six Nations. Southwell joined the exodus to France in 2009, signing a deal with Top 14 club Stade Francais. He immediately established a place in the side, even filling in at scrum-half in the Heineken Cup during an injury crisis. He also showed his versatility with a stint at fly-half for Scotland 'A' and was recalled to the 2010 Six Nations picture following injuries to Chris Paterson, Rory Lamont and Thom Evans. Southwell grabbed his chance and started eight tests for Scotland in 2010. He began the 2011 Six Nations as first-choice No.15 but injury meant he played only two matches during the tournament. However he returned to action in time to receive a call up for Scotland's provisional World Cup squad, although he missed Stade Francais' Amlin Challenge Cup final clash with Harlequins.